Coming to us from the east coast, Melanie completed her B.A. 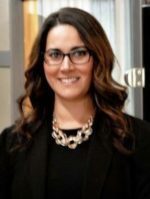 at Dalhousie University and after moving west, completed her Juris Doctor at the University of Alberta in 2015 whereupon she commenced and completed her articles and joined us as an associate in September of 2016. Melanie’s practice is primarily divorce and matrimonial property along with family law but has also gained experience in other areas of the firm’s practice. She is fluently bilingual and pleased to serve our clients in French and English. Melanie enjoys traveling, culinary arts along with sports including martial arts, swimming and is always up for a game of pickup softball. She is involved in the community and volunteers at various local events and serves on the Board of Directors for Wetaskiwin and District Victim Services. When Melanie is not out and about or at the office, she enjoys spending time with her husband and their rescue dog, Oakley.